I believe that tortellini are known all over the world, so I’m not going to give you the definition …. Preparing them at home with the help of your family will make you happy and proud of having created this tasty and difficult pasta. 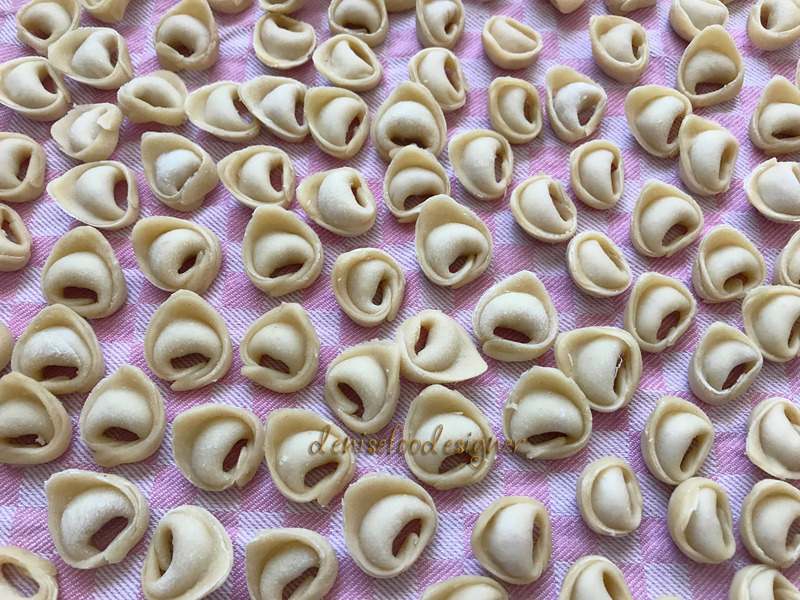 The secret in the creating tortellini is surely the purchase of quality ingredients. Also it’s important you can have a lot of patience! Do you know why? Because they will require a lot of time for their preparation and not always they will be perfect the first time, but do your best! Once you understand the technique, you will become very good! 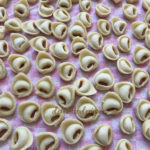 You can see the tortellini tutorial that I published on social networks to understand how to proceed correctly. Prepare the dough: place the flour on a wooden board, add the eggs and begin to knead. The dough should be smooth, so it will have to be worked for about 10 minutes. Form a ball, cover with cling film and refrigerate for at least 30 minutes. Meanwhile prepare the filling. Melt the butter in a pan and add the loin cut into small pieces. Cook for about 10 minutes. Let the meat cool and after mix it and all the other ingredients with a mixer. Put aside. Divide the dough into small loaves. Take one, while the others leave them wrapped in the cling film so they will not dry up. Roll the pasta dough through a pasta machine, starting from the widest setting, and gradually going down the settings until the arrow is between 0 and 1. The pasta dough should be very thin ( about 1 mm thickness). Proceed in the same way for all the other loaves. Roll out a rectangle of pasta on a lightly floured surface. Cut each sheet into 3,5 cm squares, place a small amount of the filling onto each square. Fold the square diagonally in half onto itself to form a triangle, then fold it again so that the corners at the bases come together to form a pocket. You can use a little water to seal the pasta together if needed.